The SBR-5216 brake roller shear acts as a 3 in 1 combination machine. 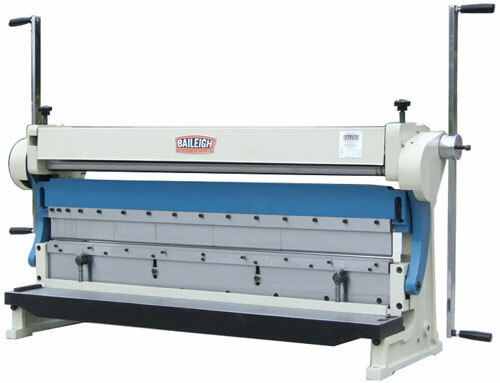 This one machine consists of a low production press brake, slip roll, and sheet metal shear. Having three machines in one makes it a real gem in small shops with limited floor space. The SBR-5216 combination shear brake roll can handle up to a 52 in wide piece of sheet metal and can cut, roll or shear mild steel down to 16 gauge thickness. This is the most powerful 3-1 combination machine on the market and is offered at a fantastic price making it reasonable for home shops, industrial art shops, and other facilities where small production runs dont justify dedicated individual machines. This manual brake roller shear has a massive capacity and is perfect for low production applications. This combination shear brake roll has a manual sheet metal shear that has a spring loaded clamp that keeps the material from lifting up, which extends blade life. The blades are hardened for long life and can be turned four times, again furthering the useful life of the blades. The manual press brake section has removable and movable top fingers (or punch) and the bottom V-block die is fixed. The movable and removable fingers allow for many types of boxes and pans to be made. The slip rolls are hardened for long life and allows for very tight radiuses to be made. The rolls come with three wire grooves, perfect for sheet metal applications. The SBR-5216 brake roller shear can be bench or stand mounted. The metal shear comes with a blade gap adjustment, as well as a material guide. The press brake has a depth adjustment for repeatable bends. The manual slip roller has a back roll adjustment as well as a top roll adjustment. These adjustments make it a user friendly machine when changing between material, thicknesses and projects.